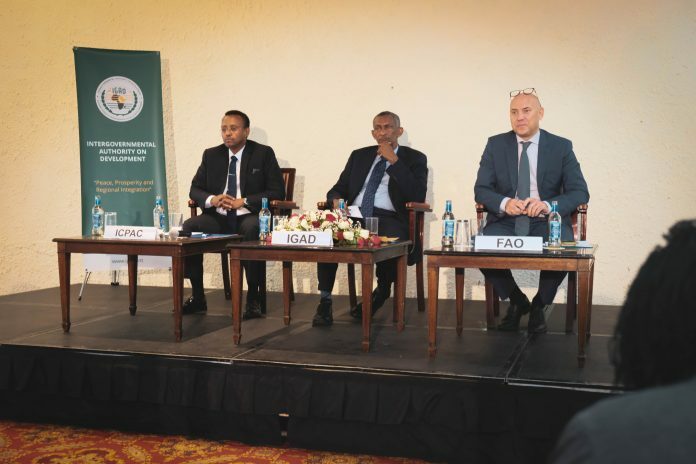 An estimated 23.4 million people are currently food insecure in the Greater Horn of Africa, and immediate early intervention is required to mitigate the food crisis, the Intergovernmental Authority on Development (IGAD) said at a conference in Nairobi, Kenya, on Wednesday. With the delay in seasonal rains, coupled with expected rainfall deficits, IGAD warned of a high risk of food insecurity for people in member states including Djibouti, Ethiopia, Eritrea, Kenya, Somalia, the Sudan, South Sudan and Uganda. according to IGAD, around 10.7 million people are suffering from food insecurity in Somalia, Kenya, Ethiopia and Uganda alone. “I would describe the situation of the drought in the Horn of Africa now as at crisis stage. There are two more stages worse than a crisis, there is emergency and famine. The classification is heading in the direction of emergency very, very fast,” Mahboub Maalim, IGAD Executive Secretary, told reporters in Nairobi. “The indicators show that trends are worsening, the environmental conditions are worsening, extreme temperatures are clear across the region… Every country should do something now, we are in stress in the region,” Maalim added. The Greater Horn of Africa has suffered from a prolonged drought for months and analysts see no near end in sight. 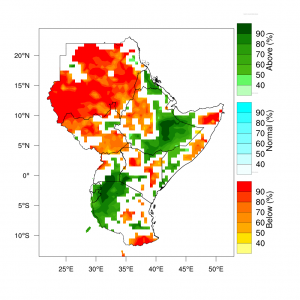 Forecasts show that rainfall levels through mid-April will likely be among the driest on record in some areas, particularly in southern Kenya, much of Somalia, Somali region of Ethiopia, and localized areas of Uganda. There is also limited hope pinned on rainfall for the month of May, with predictions that eastern Kenya, eastern Uganda, central and eastern Somalia and western Ethiopia will continue to experience below average rainfall. This current drought has been compounded by the past season’s short rains, which already led to below-average crop production and deteriorating pastures in some agro-pastoral and marginal mixed farming areas. “The urgency has developed from a delay in the start of the March to May long rains, coupled with forecasted rainfall deficits. These are building on already dry conditions due to poor October to December rains over some parts of the Greater Horn of Africa,” IGAD Climate Prediction and Applications Center director Guleid Artan warned. Within this current climate, analysts predict an atypical increase in food insecurity and livestock movement within the region. IGAD indicated that the Uganda-Kenya border, where pastoral conditions are expected to remain acceptable, could suffer from possible competition over resource and may result in localized conflicts. Within this context, the Food Security and Nutrition Working Group has urged for immediate and coordinated planning by governments, donors and all concerned stakeholders to respond to the potentially deteriorating food security and nutrition situation. “We are calling for immediate action because it is more cost-effective to protect livelihood assets through early action rather than to wait for a disaster to strike and later on to rebuild lost assets,”David Phiri, FAO Subregional Coordinator for Eastern Africa and FAO representation to the African Union and EAC said. Currently 2.76 million children under five are expected to suffer from acute malnutrition in Ethiopia, 903,086 in Somalia and an estimated 541 309 in Kenya. Within the current months, this is only expected to worsen as rainfall remains low. In total, over 4 million children are predicted to require support for acute malnutrition. This does not include the additional 3 million pregnant and breastfeeding women nor the potential additional numbers if robust prevention is not actively implemented. The ongoing drought and impact on food security has been widely linked to climate change, which has particularly impacted countries relying heavily on agriculture.